The rise in traffic accidents was also becoming a serious problem outside Japan. Against this backdrop, in February 1970 the U.S. Department of Transportation advocated the development of experimental safety vehicle (ESVs) to conduct research in order to improve vehicle safety to the absolute maximum and improve safety related technological standards. At the time, approximately 60 percent of people killed in automotive accidents in the United States were vehicle occupants. Automotive safety, particularly occupant safety, had become a major issue, and the proposed ESV development plan aimed to study and improve vehicle safety in order to protect occupants and help drivers avoid risks. The U.S. government called on the Japanese and West German governments to cooperate in ESV development. In November 1970, the United States and Japan exchanged memorandums on ESV development, and Japan formally agreed to take part in the ESV project. It was agreed that the United States would develop a 4,000-pound (approximately 1,800-kilogram) ESV, while other participant countries, including Japan, would develop a 2,000-pound (approximately 900-kilogram) ESV.1Automakers in the United States, Japan, West Germany and other countries devoted their cutting-edge technology to ESV development. In May 1971, the Japanese government finalized the specifications for Japan's ESV, based on U.S. ESV specifications, and recruited automakers to work on development. The Japanese specifications for the ESV included shock-absorption ability sufficient to protect the life of all occupants in a collision at 80 kilometers per hour, ensuring a "life-saving" space within the cabin, and preventing occupants from being thrown from the vehicle. Toyota applied to participate in development of the 2,000-pound (approximately 900-kilogram) ESV in June that year. In joining the project, the company hoped to actively contribute to accident prevention, and to gain the technical capability to respond to future changes in safety standards. Development of the Toyota ESV began in February 1971. In addition to the body and brakes, the departments responsible for the vehicle outfitting2 chassis, and drive mechanisms worked together closely, and Nippondenso Co., Ltd. (now Denso Corporation) and Aisin Seiki Co., Ltd. also cooperated with development. Following advanced development and the first and second prototype stages, Toyota's ESV was completed in June 1973, in line with specifications. From September through to the end of December, a total of 10 vehicles were delivered to the Japanese government. 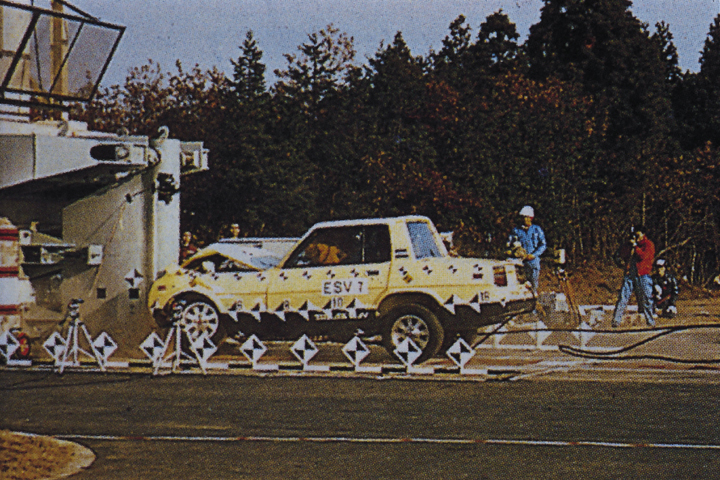 These ESVs underwent performance testing based on Japanese ESV specifications, with testing of all items completed in March 1974. In order to absorb the massive energy from a frontal collision at 80 kilometers per hour, Toyota's ESV employed an S-shaped frame at its front. In addition, creating the quarter pillar with an almost vertical configuration minimized the pillar's penetration into the vehicle cabin during a crash. To protect occupants during a side-on collision, the side construction also featured a rigid beam on the exterior, and on the interior the door trimoffered protection to occupants. Furthermore, in order to secure occupants in place during a crash, the vehicle featured a passive lap belt that fitted automatically when occupants were seated, as well as an airbag device, which inflated on impact after determining a collision was imminent to protect occupants from secondary collisions. Several new types of systems were developed, with both the front and rear wheels dually fitted with disc brakes and ESC, aiming for the optimum in braking performance. 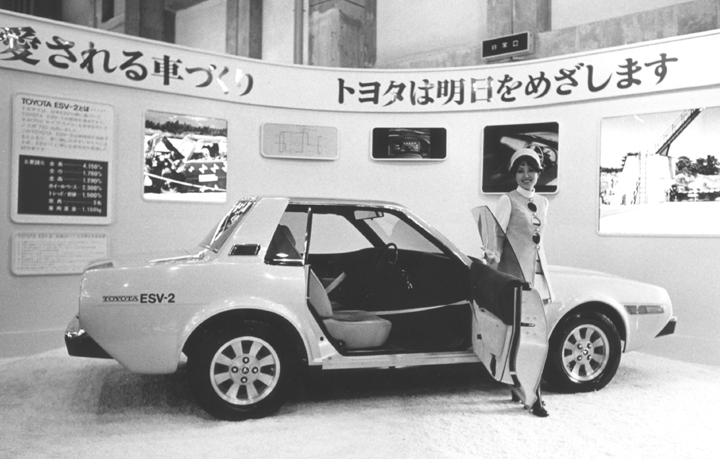 The Toyota ESV-2, the result of making practical improvements to the first-prototype Toyota ESV-1, was exhibited at the 19th Tokyo Motor Show in November 1972. Toyota's group-wide effort to research and develop vehicle safety technology gained widespread attention. Although the ESV was completed as a test vehicle, cost and productivity were not factored into the development. However, Toyota proactively incorporated the safety technologies gained during ESV development into its mass produced vehicles wherever possible. Of these, the redesigned Corona (RT100) released in August 1973 featured several new safety technologies, fusing the concept and technologies of the Toyota ESV with mass production. Structural features, including a large shock-absorbing bumper, a large single-piece plastic instrument panel, and an energy-absorbing steering column, were developed and employed in the model. 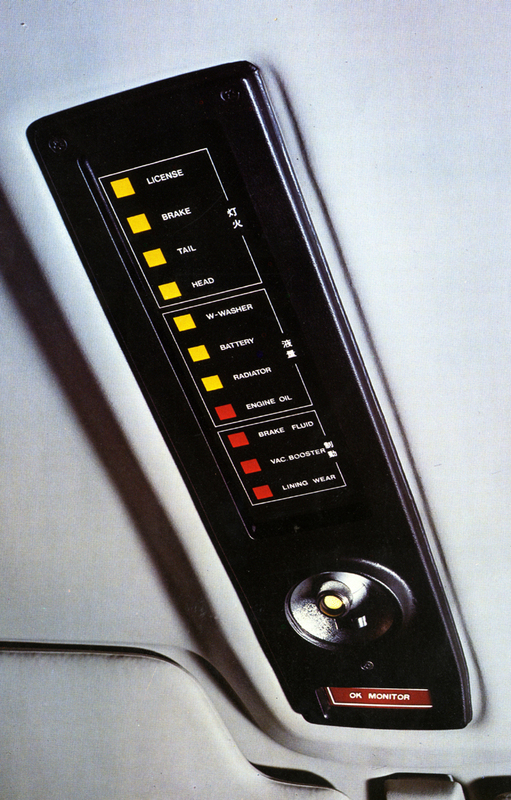 The Corona also featured the "OK Monitor"3, developed as an active safety device. These safety features won acclaim from the market, propelling the Corona to the position of best-selling compact size car for 35 consecutive months from December 1973 to October 1976. 1972 Automotive Yearbook, pp. 39-44; Japanese specifications for weight were set at 1,150 kilograms for a four-person vehicle and 900 kilograms for a two-person vehicle. The installation of equipment and parts that increase the comfort or appearance of the vehicle, or aid driving. A fault detection device that allowed the driver to confirm safety without leaving his/her seat. If an irregularity occurred in safety related components or functions sensors would relay this information to a computer for processing.